Natalie and her brother and sister, Araceli and Dayton showed up at 8:30 anxious to swim. So they were an hour and a half early, but who could imagine that I would have anything better to do than supervise swimming. Mind you these three children showed up at a (foreign) strangers house unaccompanied by a grown-up. I asked them if they were planning on swimming in what they were wearing and they said yes so I sent them in to take a shower before getting in. It's a new rule at my pool. We just changed the filter. Jorge and Fabiola who were supposed to come at 8:30 to do some English and Computer rolled in around 9:00 and were glad to have more playmates. The tortilla kids were fearless in the water and very close to mastering swimming. 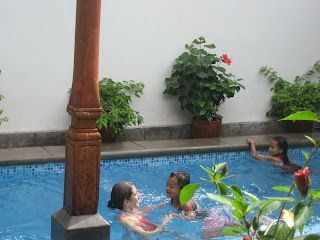 There was general merriment and hilarity as they jumped and splashed and chased each other around the pool. Some of the flowers might die, but I'm pretty sure everyone had a good time. I was a little overwhelmed watching 5 kids, so I made them get out after an hour or so. I made everyone hot chocolate and passed out oreos. Araceli wanted some to take home to her mom, and Natalie wanted some for her grandma (the tortilla maker). I gave them the rest of the bag and they went on their way. They just stopped by with the tortillas and Natalie wants to swim, now, tomorrow if not then, Sunday. I said, sometime next week when I get my energy back!